Before this month draws to a close, we wanted to let you know that March is love your indie bookstore month. Of course we encourage you to love your independent bookstores year round, and Broadway Books does too. 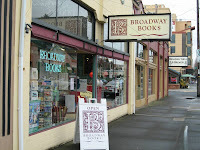 Broadway Books is located at 1714 NE Broadway in Portland. They have been in business for 17 years, and recently started a blog, aptly titled, Bookbroads. Roberta Dyer, one of the owners of Broadway Books, answered some questions for us about independent bookstores and the challenges they face. Paper Fort: You’ve been in business for 17 years. How do you account for your longevity as a business? Roberta Dyer:We think our longevity is due partly to our focus. We are a neighborhood bookstore with a limited amount of space and money, and we’re not doing this as a hobby, so we need to be extremely practical. What works for us is to laser in on this neighborhood. We support local schools and other organizations as much as we can, we know our customers’ names and their reading preferences, we employ people who live here and who have a passion for reading and a love of sharing that passion. We reward frequent buyers with our Buy Twelve, Get One Free policy, we hold readings for local authors, we foster Portland reading groups and writing groups, we special order books every day for customers, we give back as much as we can afford to this local community. Our main competitor, Amazon, is very good at getting books, and sometimes cheaper, but they are lousy at all of the other things listed above. Our customers have become educated over the years about where they shop. For every dollar they spend at our store, about 68 cents stays in this community. The same dollar spent at a national chain? Only 43 cents stays here. At a national online bookstore? Almost nothing. Every day, more people figure this out and act accordingly. Paper Fort: What are the most significant changes you’ve noticed since you opened your doors 17 years ago? Roberta: Significant changes include the conglomeration of big publishers, the rise of internet book providers who often sell books as loss-leaders, the generational shift from reading books to other forms of entertainment, the closing of hundreds of small stores like this one, the availabiity of books,often at a discount, in all sorts of venues—grocery stores, gas stations, you name it. None of these have been good for our business. The steady golden threads that run through the past 17 years are the author whose work cannot be ignored—there are so many of these—and the reader who cannot look the other way when good writing happens. If we can weave these threads on a daily basis, we are happy. Paper Fort: In addition to buying their books from an independent bookstore, what else can people do to support independent bookstores? Roberta:Besides buying books from independent stores, I would encourage people to attend the events that stores have. Foster a passion for reading in your children. Send friends and family and colleagues in. Give books, or gift certificates to bookstores, as gifts. Join a reading group. Watch less TV. Almost every Tuesday night, we have something going on at our store that’s worth your while. We’d love to see you! This Tuesday at Broadway Books at 7:00 p.m., Oregonian staff writer Jeff Mapes will present his new book, Pedaling Revolution: How Cyclists are Changing American Cities.